You can read more about these Board priorities on the Board's website at www.yrdsb.ca. At Westminster P.S. 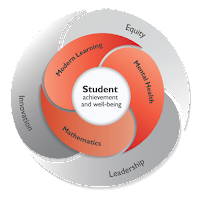 we strive to support these priorities while always having student achievement and well-being at the core. We are continuously working to create a positive school environment to enable your children to grow academically, emotionally and socially. Your partnership and support is crucial for these goals to be achieved. We thank you for your interest in your child's school and school community. Please continue to ask your child about events in the school and about their learning. Thank you for your support and interest in their educational progress. We hope you will also join us in as many school events as possible to support our school community starting with our School Council meeting on September 27th at 7:00 p.m.
Our first Community Outreach event is the Family Autumn Ball on October 25th 6:00 -8:00 p.m. Admission is $2 a person and dinner packages will be available for pre-orders with order forms coming soon. If you are available to volunteer your time in support of these school programs, please come out to our School Council meetings and meet other parents and staff. We welcome all of you to join us and be part of our school family to continue to make WPS a great school for your children.